↑ "Manis pentadactyla". IUCN Red List. 2014. मूल से 9 February 2015 को पुरालेखित. 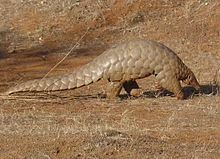 ↑ "'Asian unicorn' and scaly anteater make endangered list". Phys.org. 19 November 2010. मूल से 11 December 2014 को पुरालेखित.